Rob N: In Marvel's four-colour world of malevolent villains with grandiose schemes, Ultron offers us a very pure and clinical sense of evil, detached from human emotions and feelings that might cloud the motives of even the sinister Doctor Doom who, lest we forget, got all upset and emotional at 9/11 in Amazing Spider-Man Vol. 2 #36 and, despite having tried to murder millions of people himself many times in the past, helped with the rescue work on the ruined Twin Towers, because all Marvel villains that day seemed to agree that that was a step too far in villainy. Though I didn't see Ultron there giving a hand at Ground Zero! And nor would we, because Ultron would simply have taken advantage of the dense configuration of sobbing and off-their-guard super-powered heroes and villains in one place to unleash a furnace like ion beam from a specially positioned orbiting satellite to cauterise the entire area. Ultron doesn't care if you're a hero or a villain – he doesn't care that you're taking a moment out to help the injured and the dying – he just wants to see you all dead. You can't reason with him and you can't offer him anything. All he wants is a mound of scorched human skulls high enough to touch the moon. Roy Thomas is famously on record in various interviews where he says how even in the early days of working for Marvel he had seen the way that artists like Jack Kirby and Steve Ditko weren't profiting from their many successful creations, and he resolved not to create anything new for Marvel that they might profit from at his expense, but rather to just use what they already had on the books. At some point he gave way though and in a memorable series of issues of Avengers created both Ultron and the Vision – two characters that formed a family unit within Avengers mythology, linking in not just themselves but also the Pyms (Hank and Jan) and Wonder Man. A rising theme within SF during the '60s was the idea of inhuman machines (and nascent computer intelligences) turning upon mankind with cold, brutal efficiency. The computer system HAL in Kubrick's 2001: A Space Odyssey was the most publicly visible example of this new menace, but it was soon joined by other movies such as the Demon Seed and Westworld, stirring up an almost luddite fear that man's steel and chrome devices would one day turn upon him like Frankenstein's creation. This it seemed was the future as society began to accelerate upon a scientific path that would surely lead to moon bases and flying cars by the 1990s, if atomic mushroom clouds didn't doom us all first. Often the stories incorporated both ideas at once – Harlan Ellison's classic short story 'I Have No Mouth and I Must Scream' skilfully combines all the paranoia of the machine age turning sentient with the idea of total armageddon at the hands of our computer controlled nuclear stockpiles. Doctor Strangelove is all the more chilling when it is a logical but flawed doomsday-automated system that can't be shut down. Ultron-5, when he appeared in the mid '60s run of Avengers, was Marvel's first serious stab at a purely machine like menace, but it wasn't until his second appearance in the pages of Avengers #66 to #68 that he became the deadly force that we know today. I came across the comics when I was 10 years old, living in Great Sutton, near Birkenhead on the Mersey, and this was a paradise for a young comic collector in the early '70s for great cargo ships would dock carrying thousands of remaindered American comics as ballast. These would be off loaded in bulk and sold for a pittance to any shop prepared to take them. The streets were practically paved with American Marvels and DCs, not to mention the many low brow American 'Men's Sweat' magazine pulps that always looked seedy in the window displays of damp-riddled bookshops with wire mesh screens across the windows. The mecca for second hand comics at the time was a filthy, run down second hand magazine and book store called Broadway, close to Birkenhead, and it catered to the dirty raincoat brigade and young kids in equal measure. Every Saturday kids would check out the boxes of second hand Marvels and DCs for 3p each, oblivious to all the seedy men shuffling around the wall displays where magazines with big-breasted women being whipped by Nazis were on display. And then, one Saturday, I hit the place at just the right time. Some kid's parents had obviously offloaded his prize collection in bulk to the shop, for there were close to 100 Silver Age Marvel titles – all good ones too, ranging as far back as issue #13 of the Fantastic Four, and all available for 3p each. And there I was with approximately 25p in pocket money, my heart beating wildly, knowing it was surely only a matter of half an hour or so before the rest of the local kids started turning up with their pocket money, helping themselves to my new found treasure trove. Like someone finding a hoard of gold without any sacks to load it in, I had to buy the best 8 titles (an impossible choice!) and then cycled like the Devil was on my tail back home, to burst into the living room and demand that my Mum advance me my birthday money RIGHT NOW, no questions asked – I haven't got time to argue – otherwise I'll just simply kill myself! By the time I cycled back to Broadway with £1.50 in hand, the first of the kids had begun to arrive and, wasting no time, I simply grabbed armfuls of comics and dragged them away to a private corner of the shop to sort through them like a feral cat who had just wrestled a ragged meat bone from a dustbin in the face of stiff competition. 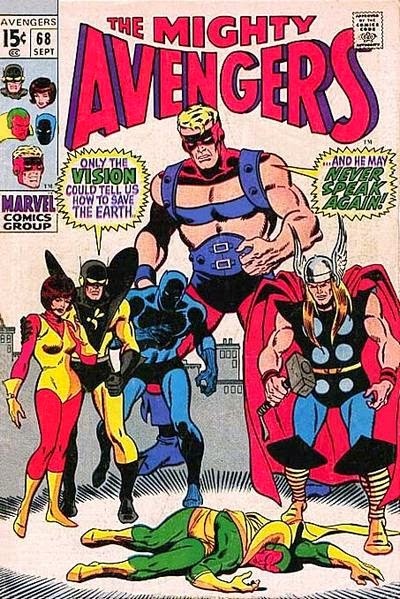 And in amongst the haul of booty I took away that day were issues #66 to #68 of Avengers. I still think they hold up well as part of a classic run of Avengers that began in the early #60s and carried on well after issue #100. They were part of a period of Marvel history when the mythos that we take for granted today was still in the process of being built character by character. Every few issues seemed to add something substantial to the Marvel Universe in a way we haven't seen now for a long time. And so issue #66 opens with the first sight of SHIELD's latest creation – Adamantium – in this case a prototype metal cylinder that once cast from alloys can only be reshaped by a 'molecular rearranger'. The Avengers, Thor in particular, have been called in to test the strength of this new metal and to their dismay they find it impervious to their best efforts (though Thor's mallet does apparently mildly dent it). The Avengers greet this new alloy with barely concealed concern, for they can see how dangerous it would be if it ever fell into the wrong hands. Meanwhile, their newest member, the Vision, has been acting stranger than normal. While never exactly the life and soul of the party, the Vision has become even more withdrawn and secretive of sorts and we soon discover why. Having been created by Ultron-5, we now learn that Ultron had placed certain commands within the android's brain to be triggered in the event that Ultron may have been destroyed. Unable to resist, the Vision in secret retrieves Ultron's discarded headpiece and then, late at night, steals into the SHIELD base to violently overpower the guards and take both the experimental Adamantium canister and more importantly, the molecular rearranger. In a particularly brutal moment, most unusual for 1960s Marvel, the Vision is seen to clearly murder all the subdued SHIELD agents by shutting down the oxygen supply to cover his tracks. Then, like some proto-slasher horror film, the Vision turns his attention to Avengers mansion and begins to take out his former teammates, starting with the Wasp. Her screams bring her team mates running to find her frozen near to death, whimpering from the effect of the Vision's ghostly body passing through her and partially solidifying in the process. 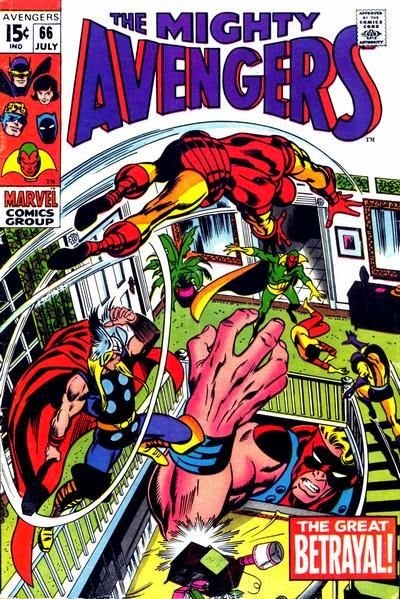 A fight breaks out, led by Hank Pym in particular, as his stunned colleagues come to terms with the Vision's betrayal. But all this is to keep the Avengers occupied long enough for their computer mainframe to rebuild Ultron from the shattered remains and intact headpiece that the Vision had previously collected. The Avengers realise this too late as the closing pages reveal the new battle ready form of Ultron-6, now upgraded to a shell of impervious Adamantium and ready for mass murder. 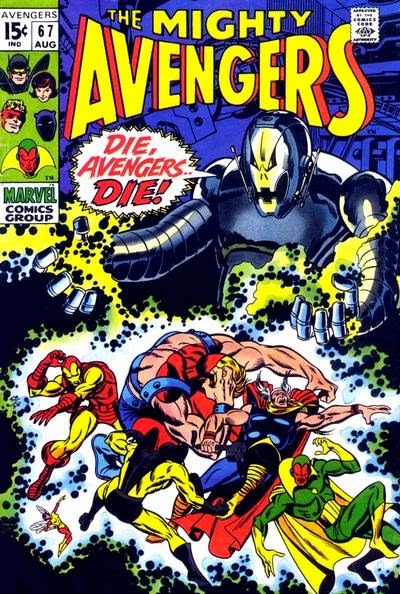 Issue #67 opens with a streetview of an explosion tearing through the top floors of Avengers mansion as a psychopathic Ultron-6 unleashes hell on his hated enemies. Tearing through the team members who are unprepared for the robot's indestructible new body, Ultron deals serious damage, but breaks away when they prove too slippery to kill, because in the end he desires the total destruction of the Earth and fighting the Avengers is simply delaying matters. As the Avengers lick their wounds, the only glimmer of hope seems to be that the Vision has broken free of Ultron's spell and realising what he has brought about, flies away to take on his 'father'. But by now SHIELD have discovered what the android Avenger has done and fighter jets full of armoured agents have been despatched with suitable weapons to bring the Vision down. They arrive at Ultron's former base just as the Vision is attempting to stop Ultron from arming his atomic weapons and in a three-way battle the Vision is cut down. The Avengers realise New York is but moments away from being levelled in a ground zero blast. Issue #68 sees the arrival of the Avengers even though they know there isn't much hope of stopping Ultron before he activates his weapons. And they're right. Nothing they can do can stop the robot, and he completes the countdown sequence, only to see nothing happen, for it seems that before the Vision attacked Ultron he disabled the weapon systems. Enraged, Ultron breaks out, swearing to damage far more than just a capital city. And with the Vision now incapacitated by SHIELD, the Avengers seem to have lost the one member with an ability that could bypass the Adamantium shell. With time running against them, the Avengers are forced to set a trap to lure Ultron-6 out into the open and with the aid of a canister of Vibranium despatched at speed by the Black Panther in Wakanda, try to bring him down. Needless to say at this moment of great crisis, all the Avengers look worried, but none more so than the Wasp on the second panel of page 9. “What's wrong, honey?” asks a concerned Hank Pym as everyone else is readying for the final battle. Here's to Ultron in all his incarnations. Evil never looked so sleek!